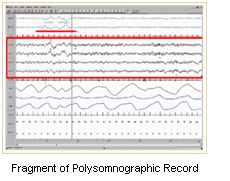 The overnight Polysomnogram is used to help evaluate possible causes of excessive daytime sleepiness, tiredness and fatigue as well as to diagnose some specific sleep disorders such as sleep apnea, periodic leg movements and narcolepsy. During a full sleep study, the staff will monitor your brain wave activity, leg muscle activity, chin muscle tone, eye muscle movement, heart function, breathing patterns, and blood oxygen levels. Small metal discs (electrodes) and other special sensors detect these signals and send them to a computer. The electrodes and sensors are attached onto the surface of your skin and are embedded in belts that the technologist put on your chest and abdomen. We will video monitor you during the night for your safety and to observe any characteristic behavior during your sleep such as sleep talking, sleep walking and teeth grinding. We will ask for your written consent for the video recording. It will take the technologist about an hour to prepare you for the procedure. This is a simple process of attaching electrodes, using a removable cream/gel and tape. The electrodes do not pierce the skin. 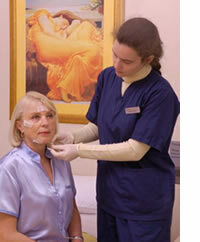 There is no discomfort involved with the electrode application. These monitoring devices are not uncomfortable and will not restrict your ability to move around during the night. 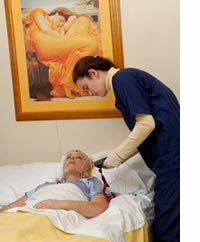 For a sleep study you will spend the night in a comfortable and private room with a bathroom close by. You may bring your own pillows or bed accessory if it will make you feel more comfortable. The technologist will be available to assist you during your stay in the Sleep Lab. Do not be afraid to ask questions. If you have to go to the washroom during the night, just use the call button, and the technologist will disconnect you from the recording equipment. You should eat your usual evening meal before coming for the test. Please take all regular medications, unless otherwise advised by your doctor. Ensure you have the telephone number of the sleep clinic so you can call them if you have any questions. You will be asked to fill out a few short questionnaires at the clinic. You will usually be free to leave the clinic between 7 and 8 a.m. The data obtained during an overnight sleep study is converted to at least 800 pages of record on how your body functions during sleep. The analysis and interpretation of this data is labor intensive. Therefore, it may take up to 4 weeks for your doctor to receive the results. The results from your sleep study will help your doctor choose the appropriate treatment for your particular sleep problem. Going for a sleep study is a positive step towards a better night's sleep and a more alert day. "What if I cannot sleep?" The staff is well aware that this might be a problem and does not expect that you will be able to sleep just as well as you do at home (although a lot of people sleep in the lab better than they do at home). Great efforts are made to make the environment as friendly as possible. Please remember that people often sleep two or three hours without knowing it. A great deal can be learned from just a few hours of sleep. If you do not sleep at all, you and your doctor will discuss the next steps. We will NOT give you medication to put you to sleep. "Do I have to sleep on my back all night?" No. The wires are long enough to allow you to turn over and to sleep in any position. "Will the technologist know what I am dreaming about?" No. They will notice when you are in a dream sleep but they DO NOT KNOW what you are dreaming about. We have several patients booked each night. It takes about 10 minutes for registration and 60 minutes to get set-up with the electrodes and other paper works. We will try and have you go to bed as close to YOUR NORMAL BEDTIME as possible. Unless it is for medical reasons, we advise that the patient sleep alone in the bedroom. You are welcome to bring someone with you to the set-up portion of the sleep study.